Techniques to differentiate between materials are a powerful addition to the structural information traditionally available from optical coherence tomography images. We present label-free detection of water and lipid at a micrometer scale by evaluating their unique dispersion properties. Using a tri-band swept source configuration, we measure both 2 and 3 and show how to identify the two materials at sample thicknesses of 40 and 90 m, respectively. We propose a new numerical method for speckle reduction in Fourier domain OCT based on incoherent averaging of fractional Fourier domains of a single A-scan. Fractional Fourier transforms represent projections in the time-frequency space and thus, this method simultaneously compensates for group velocity dispersion. We present detection of water and lipid at a micron scale by evaluating their unique dispersion properties. Using a triband swept source configuration, we measure 2 and 3 and show how to identify the two materials at a sample thickness of 40m and 90m, respectively. This report reveals exciting new prospects for label free differentiation and segmentation using optical coherence tomography. 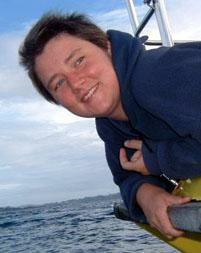 Frederique Vanholsbeeck is with the Department of Physics at the University of Auckland. Dr. Vanholsbeeck's principal research area is now biophotonics, i.e., using light to observe and to understand physiological processes.